It was the New Year, Cheeky and I were heading North to the icy forests and lakes of Finnish Lapland. If I am not loitering with intent in the mountains then this is my other favourite environment… forests, snow, lakes, minus temperatures and very few human-beings other than Scandinavians. We flew into Kittilä airport, being initially concerned that we had caught the wrong flight to downtown Narnia! Tuuli our guide picked us up and took us to our abode for the first part of our adventure in Ylläs where we made ourselves comfortable despite the freezing temperatures outside. The next day we had time to wrap up warm to ski in -24°C with freezing winds dragging it down to -33°C and generally discover the local area of Ylläs, but that evening we were off for our first experience at the Ice Village. We turned off the main road onto a forest track for a mile or so until we reached the Ice Village. From the outside was what looked like a collection of large igloos connected together with a log cabin acting as the reception out front. At first we were given a tour of the vast complex. The Hotel section has a chapel where couples can wed, countless corridors plus an abundance of bedrooms that one can stay the night in. 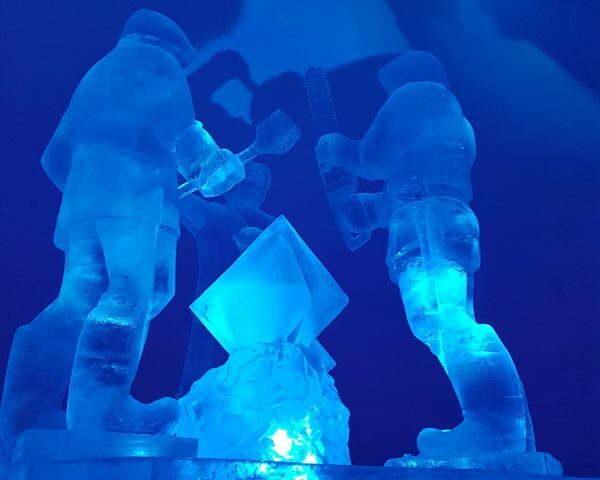 Each room, many of the corridors and connecting corridors are decorated with stunning ice sculptures or twinkling lights. 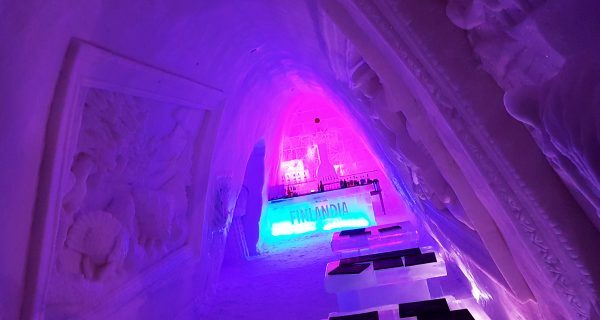 The restaurant that we were about to eat in is housed in a giant Igloo with a fantastic central ice sculpture and an ice bar off down one of the corridors. We sat on fur rugs, whilst I put my rucksack down on the snow for Cheeky to keep her feet insulated from the snow. We started with a delightful platter of Local specialities like Cold Smoked Reindeer, marinated mushrooms, Whitefish Roe and cloudberry jam, Smoked salmon. For main course we had the most succulent Reindeer filet and neck with roasted new potatoes. When it comes to meats, Reindeer is firmly my favourite meat, I just wish there was more of it in my life. Dessert was a very tasty meringue sitting on fruits and crumble, after which we made our way back through the cabin to sit by the fire whilst drinking hot chocolates and coffees. 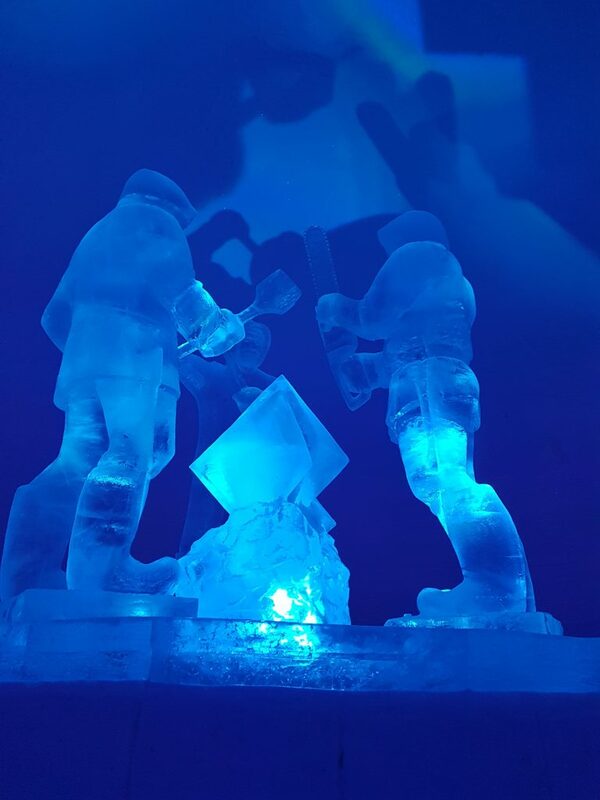 With so many weeks of hard work it takes to build the Ice Village for it all to melt in Spring, the Ice Village really is a unique experience. The next day we headed off to Tatuka Reindeer farm. 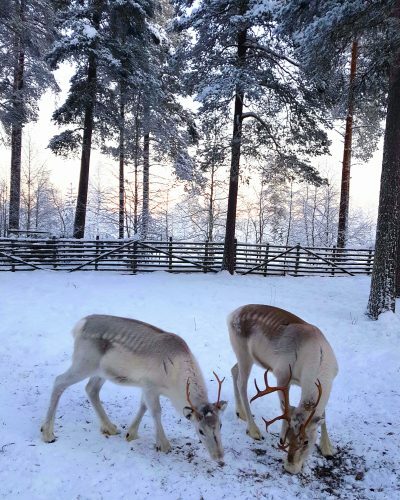 We approached the farm to find a cosy little log cabin in the woods surrounded by pens full of Reindeer. 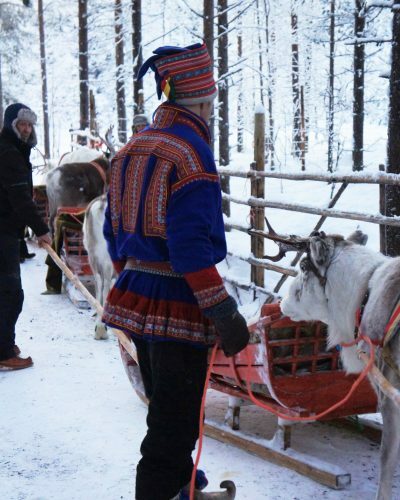 We were introduced to an elderly Sami by the name of Martii who was dressed in traditional Sami clothes with a blue decorated smock and hat plus reindeer boots to top it all off. Through translation he gave us some background about the farm and then proceeded to led us through to our sleighs. Unlike Santa’s sleigh there was only one reindeer per sleigh. Cheeky and I jumped into the sleigh at the back, grabbed the reins and made ourselves comfy under the Woolen blanket. Martii started by leading the sleighs at a walking pace, but once he jumped his sleigh at the front the race began. I had never thought that reindeer could run so fast on snow. The power in our Reindeer was immense, he pulled us along as if we weighed nothing at all, which was definitely not true with the amount that we had eaten over Yule. As we approached bends the sleigh would slide out to the side just reinforcing the speed that we were travelling at; allegedly these beasts can outrun race horses. Once through the forest it was out onto the frozen lakes and rivers where the vast wintery landscape raced by at high speed. Once it was time to head back into the forest we had a short climb which did not seem to slow our Reindeer at all, he powered his bulging leg muscles that would put any body builder to shame. We made our way back to the start, where we could dismount the sleighs and had the opportunity to feed our trusty Arctic friend some very tasty reindeer moss; rather them than me, I have eaten the moss boiled before, it was not the most pleasant of experiences. We made our way to the cabin for hot berry juice with biscuits to hear more about the life of a reindeer herder and the Sami culture. 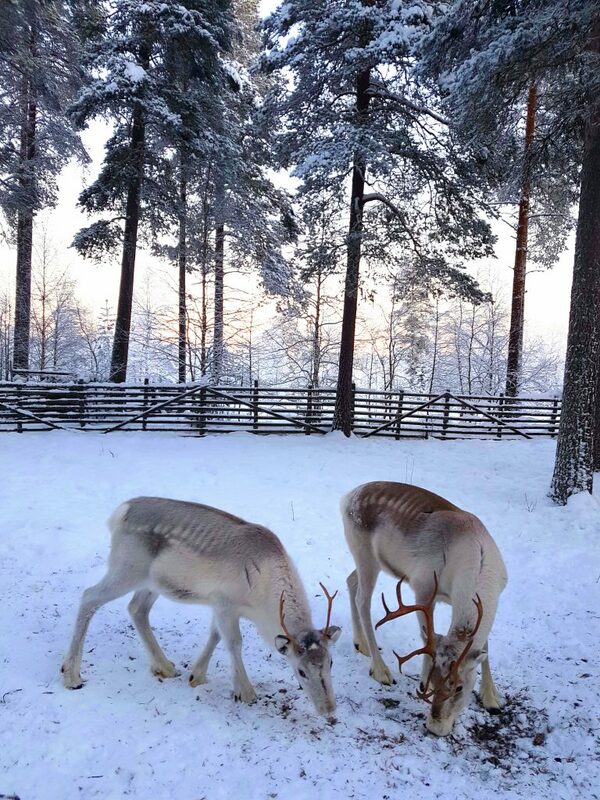 To finish the experience we got to enter an enclosure where we could feed young reindeer with more moss and get a little closer to these magnificent animals. They seemed to have various characteristics, some being pushy and quite boisterous whilst others were timid keeping to the back, so we made sure we got food to these smaller more timid deer. 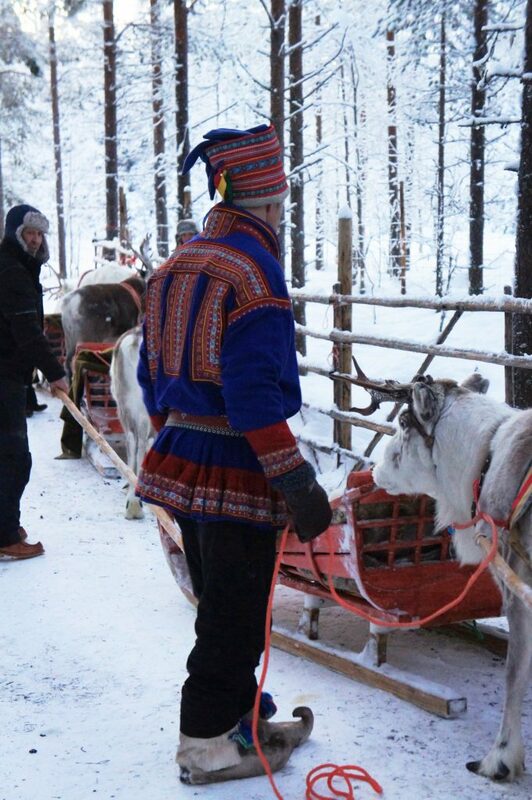 They really are majestic creatures, that are at the heart of Sami culture, history and life; we felt honoured to experience these animals up so close. The following day we were up early and on our way for a totally new experience. 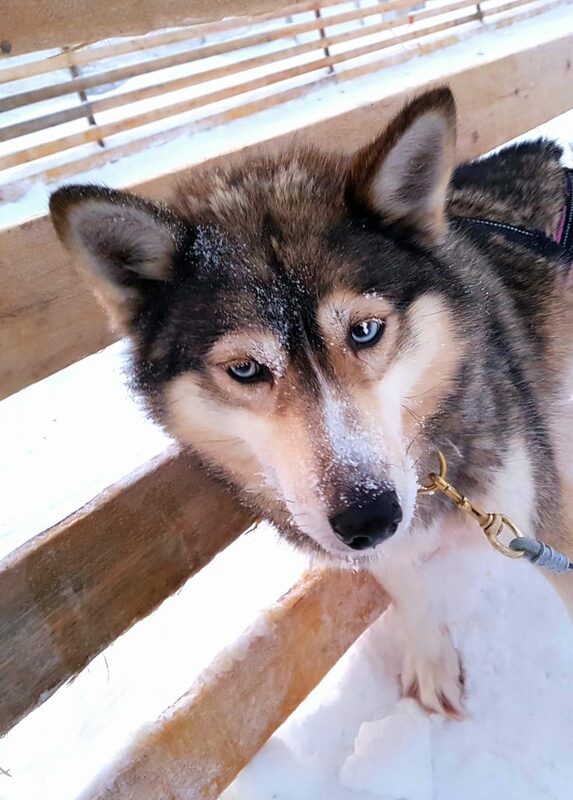 We arrived at the husky farm to the sound of 150 very excited Huskies howling and barking, breaking the silence of the peaceful northern landscape. We would be the first outing of the day for the huskies, which apparently meant they would be raring to go and would potentially be at their fastest of the day. We were given a succinct brief on how to drive the dog sleds, which seemed pretty straight forward, we then teamed up and chose our sleds. Cheeky and I cunningly selected our dog sled at the front of the pack which consisted of two very cute smaller dogs at the front who apparently had all the brains, followed by a second and third row of muscle bound Dogs, with the largest and most eager at the back. We were to follow a snowmobile guide in front, once they hit the gas our dogs were off charging through the snowy Lappish wilderness. 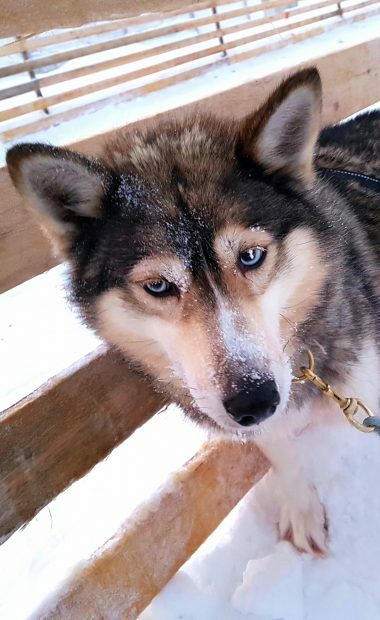 The Huskies were like a crazed pack of lovely lunatics, jumping around, barking, mucking about all at high speed and whilst pooping at the same time, the ultimate multi taskers… I am not sure I could do the same. The sun had only just come up so the sky had a gorgeous salmon pink glow which lit the Arctic landscape creating a very surreal experience. Cheeky was sitting on the sled while I drove the sled, leaning into the turns, encouraging the dogs to go faster with howls and whistles, which seemed to only confuse them more than anything. At the halfway point we swapped places so Cheeky could drive whilst I got to relax, taking in the breathtaking scenery flying by. Once back to the farm we got to spend some time stroking the dogs and generally thank them for their hard work. It was then into the Lavvu to warm ourselves by the fire and discover more about a dog’s life in Lapland. Once all extremities were brought back to life we had a chance to meet the young puppies who were to be the next generation of sled teams. These were the most gorgeous bounding little balls of fluff, charging around us at high speed until I crouched down and one of them transformed into a lapdog by jumping onto my knee which encouraged the other to jump all over me. If only I could have smuggled one out in my Arctic down jacket, probably only to have him destroy every item I own at home. These are working dogs and to have them locked up in doors is a recipe for trouble we were told. After this phenomenal experience we headed off for a spot of lunch at Levin Lapinkylä a historic farmstead near Levi. The main building was a large, cosy log cabin with traditional Lappish decoration. The traditional food was delightful and Erja the owner told about Lappish history and traditions over lunch, which made for a wonderful experience. 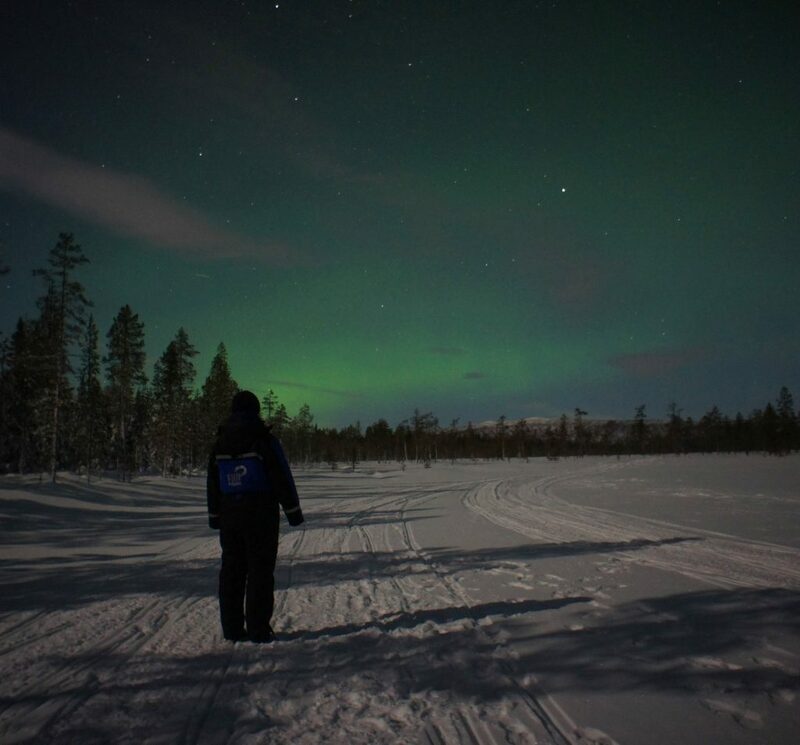 On the last night of our adventure we were to venture out into the Lapland wilderness on Snowmobiles in search of the famous Aurora Borealis. We suited up for the chilly Arctic air and after a thoroughly detailed briefing on driving Snowmobiles from Mark our guide, Cheeky and I jumped onto a Snowmobile ready for an adventure. Whilst leaving the civilisation of the Levi ski resort behind we kept our speed down as we drove out to the edges of the town, but once out on the ice of the lake, we were able to ramp up the speed. 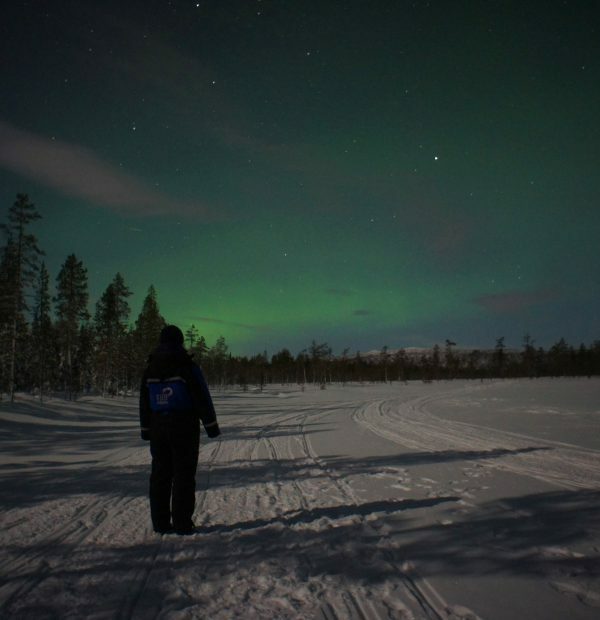 With our guide in front we sped through the night flying across the ice with the stars twinkling above us. Now and again we would speed through a forest as we moved to another river or lake. Eventually we arrived at a cabin far from the town. 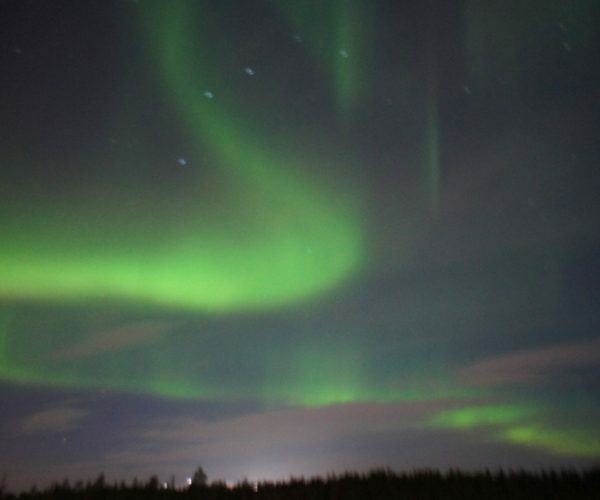 There was no light pollution, perfect for spotting the Northern Lights. Once we switched off the growling engines, an eerie silence struck us all, reminding us of the solitude that can be found in the Arctic landscape. The still calm was only broken by gasps and wonderment as the Northern Lights started up their ethereal dance way up in the sky above us. Without a doubt we were all blown away as it shimmered in the distance, continuously changing shape and form. I was determined to capture it on camera, so as recommended by a freak encounter with someone who had the knowhow, I set the ISO to 1600 with a 1 to 5 second aperture and the F-stop set to 2.5. It worked! 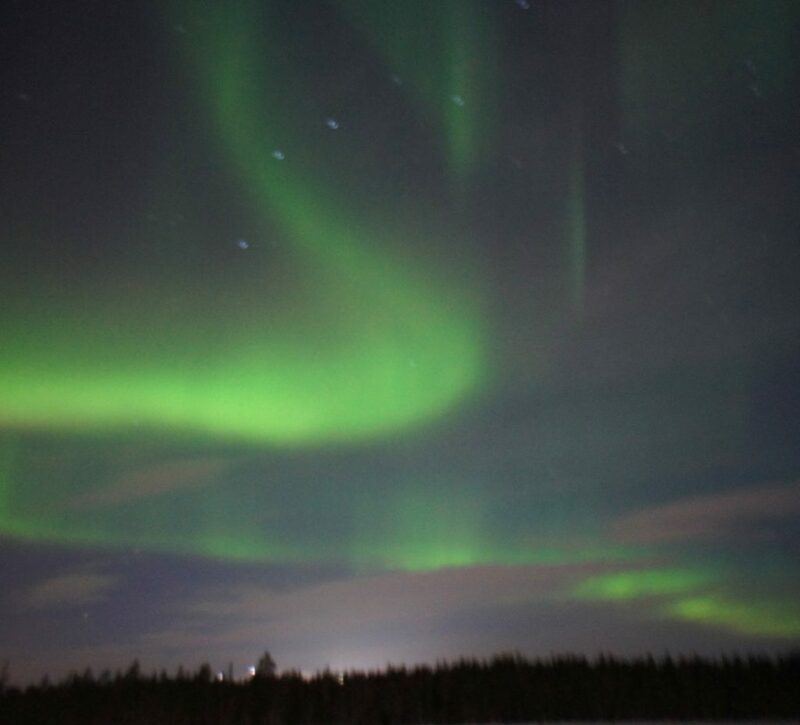 If a little blurry at times, I managed to capture the northern lights. Inside the local log cabin Mark had started to prepare some hot food and coffee, so once we had our fill or Aurora Borealis it was time to fill up on Reindeer sausage and pancakes. At this point I whipped out my telescopic Sausage-stick or as the Laps call it makkaratikku, and proceeded to push a Reindeer sausage on the end of it so I could stick it in the fire, do not worry though if you do not have your own, Lapland Safaris are happy to lend theirs. After we all gobbled down some local sausage it was time for the Pancakes made from banana and egg which turned out to be Paleo and Gluten Free, perfect for Cheeky and me. All was washed down with coffee brewed over the fire… yum! Once finished it was back outside for a little more Northern Lights, then onto the snowmobiles to race through the night back to our warm beds… exhilarating. 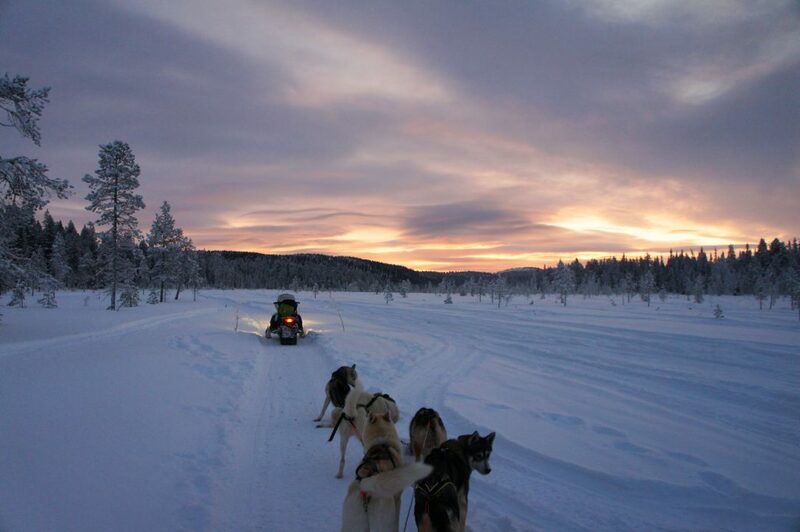 Finnish Lapland won our hearts, with warm people and stunning landscapes. In fact I would go far to say that I would be happy to move here for a Winter to experience life as a local. 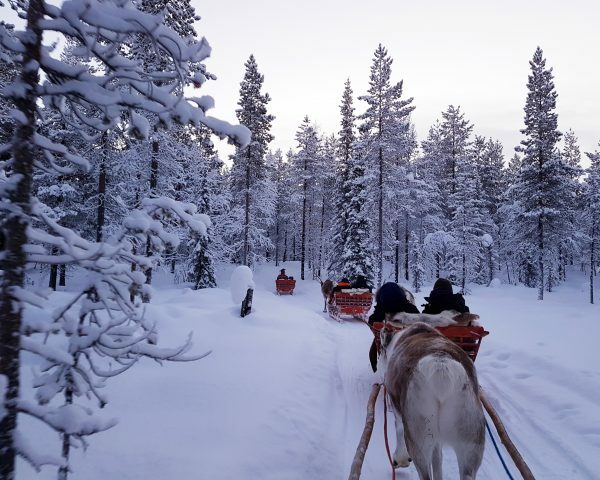 The Skiing at the resorts of Ylläs and Levi were great fun and there were many other activities that Lapland Safaris run from Ice fishing, snowshoeing, staying in a glass igloo at Levin Iglut to meeting Santas Claus! 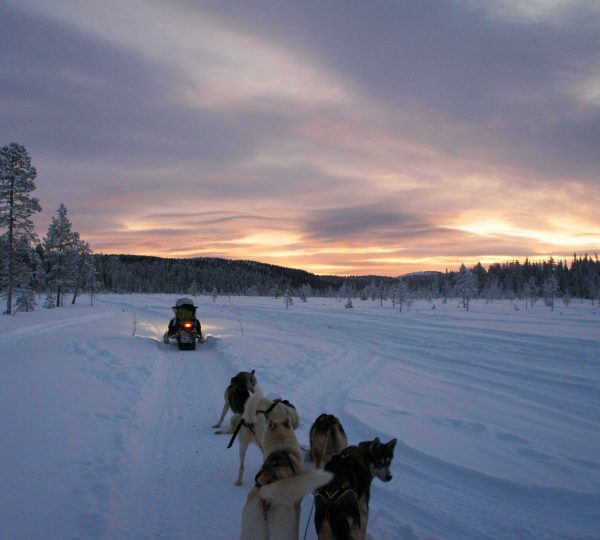 Trips with Lapland Safaris can be organised through Crystal Ski Holidays. – A week’s half board at the Lapland Hotel Saaga in Ylläs is available from £807 per person, including flights from Gatwick and transfers. 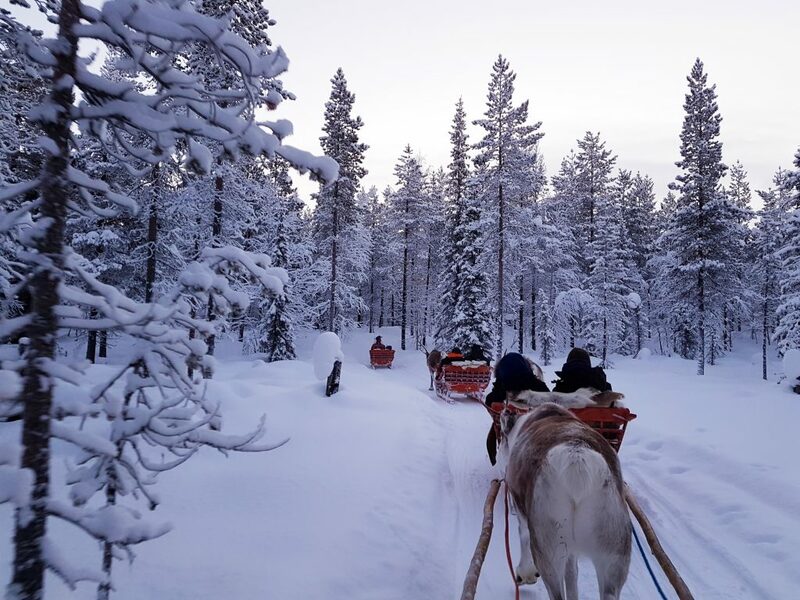 – A week’s half board at the Lapland Hotel Sirkantähti in Levi is available from £553 per person, including flights from Gatwick and transfers.